A detailed handbook for volunteer parents or other adults who coach youth football covers everything from the fundamentals of the game of football, to fitness drills, to how to encourage good sportsmanship and teamwork, emphasizing a safe and positive approach to youth sports. Original. Part I: Kids` Play: Getting Started Coaching Football. Chapter 1: Teaching Football to Children. Chapter 2: Preparing for a Fun and Successful Season. 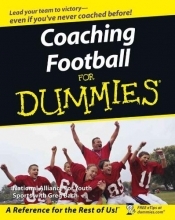 Chapter 3: Tackling the Football Basics. Chapter 4: Meet the Parents. Part II: Building Your Football Coaching Skills. Chapter 5: Evaluating Your Team. Chapter 6: Running a Great Practice. Chapter 8: Refining Your Coaching Strategies. Part III: Working with Beginning and Intermediate Players. Chapter 10: Defensive and Special Teams Fundamentals. Chapter 11: Fundamental Warm-Ups and Drills for Beginners. Chapter 12: Coaching Football Offense 101. Chapter 13: Coaching Football Defense 101. Chapter 14: Taking Your Drills to the Next Level. Part IV: Advanced Football Strategies. Chapter 15: Coaching Offense 201. Chapter 16: Coaching Defense 201. Chapter 17: Coaching Special Teams. Chapter 18: Implementing Advanced Drills. Part V: The Extra Points. Chapter 19: Keeping Your Players Healthy. Chapter 20: Challenges Every Coach Faces. Chapter 21: Coaching an All-Star Team. Chapter 22: (Almost) Ten Ways to Make the Season Memorable. Chapter 23: Ten Fun Ways to End the Season on a High Note.